This consensus made us even more convinced of the importance of rare coins through our Rare Coin Program (RCP), because they address all of these concerns. ASI cannot stress this enough. The opinion of many experts is that 10-15% of your net worth should be held in precious metals in core holdings for maintaining buying power and stability. ASI believes that precious metals are 'wealth insurance' to protect against catastrophic circumstances and volatile movements in your other investments. While this percentage in a healthy portfolio should remain the same, things have changed. In today's volatile marketplace, you also need alternative investment assets beyond precious metals for wealth protection. Market predictions are anything but reliable. And, where one is able to make more accurate predictions, things look unstable to say the least. As a result, ASI agrees with the experts at Investment U: We must focus on protecting our downside as never before. ASI has spent a long time building a Rare Coin Program that aligns potential upside, wealth protection and professional expertise to give you the edge in today's market. Our focus was to build a portfolio that can vary irrespective of the volatility in other markets and can be an effective protection from potential downside risk. Because our clients know the need and value of precious metals, rare coins are a natural transition and an excellent opportunity. ASI is now proposing that over and above the 10 - 15% of net worth held as a core portfolio in precious metals, 5 - 10% of your total investment portfolio be in rare coins. 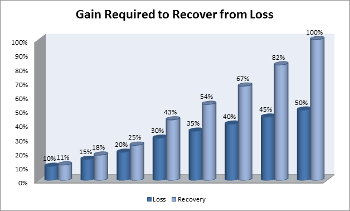 If an investment loses 40% of its value (as the stock market did in 2008), it needs to gain a whopping 67% of added value to recover the loss. This chart provides a clear picture. A market correction or collapse occurs approximately once every eight years. When the downward trend finally reverses, it takes between 18 to 24 months for full recovery. Compared to other asset classes, the rare coin market is a classic picture of stability and historically proven performance. 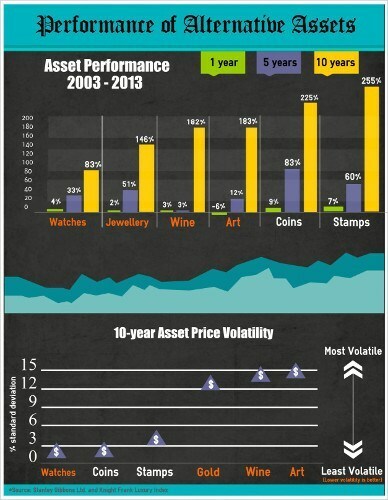 Rare coins have gained an average of 11% per year for the last 40 years and recent performance has been even stronger. Stability versus profit is usually a difficult compromise. Typically, greater profit potential takes greater risk. An example I use in my presentations is that of the penny stock. You can buy penny stocks for less than five dollars per share, with great profit potential - often up to 50% in one day. The drawback is that there is no long-term stability and no downside protection. The greater the profit potential, the greater the risk. This is an extremely volatile investment type. On the other side, are no-risk assets like CDs or savings accounts which might pay half percent to one percent. Recently, a local bank touted a two percent return on a five-year CD. This is simply a recipe for losing buying power over time. The opposite side of the spectrum is true here. This is an extremely stable investment, but you sacrifice profit potential to achieve this level of stability. Most of us try to be in the middle, not too much risk with at least some potential for growth. Here we find blue-chip stocks or certain interest bearing corporate bonds. The key argument for rare coins is their risk return relationships are simply better than traditional assets. The combination of profit potential along with historically proven stability is a 'rare' combination that is difficult to match in any asset class, let alone alternative investments. The chart below is visually compelling. Because the demand side of the rare coin market is collector driven, the price upside of this investment is totally uncorrelated to the price of any other market. Collectors are willing to pay a price driven only by their desire to own that rare coin; not the economy and not by any traditional measure. This is reflected in the rare coin portfolio value when compared to traditional portfolios. 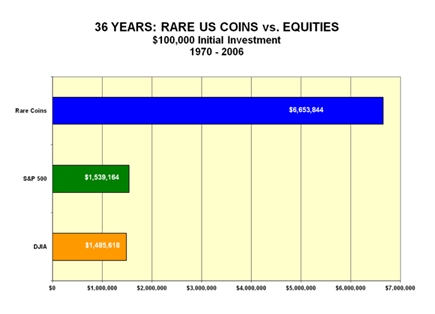 The rare coin portfolio value, in the example above, is more than 4 times more valuable after 36 years than any stock portfolio. The most common statement I get from newcomers to our Rare Coin Program goes something like this, "The numbers look great, but I have no idea what to do when it comes to buying the right rare coins." We understand. That's why we have specifically tailored our program to give you one-on-one, hands-on expertise with your rare coin portfolio. Douglas Winter is an expert in pre-1933 U.S. rare gold coins, which is a focus of our program, and he works directly with us in our Rare Coin Program. He is one of the most well recognized names in the industry and has written 13 books on the subject of rare coins. Buying and selling coins since he was 12 years old, Doug has amassed a lifetime of knowledge on the subject that is unparalleled in the industry. PCGS, a top tier coin authentication and grading service, asked Doug to be involved in establishing the criteria by which coins would be evaluated for their value and condition in their formation in the 1980's. Doug is also a contributor to the famous 'Redbook' which is essentially an encyclopedia of U.S. Coins. Having the expertise of Douglas Winter and ASI give you individual attention on your portfolio. We believe this is the best way to achieve success in this asset class. One important difference in our program is that we do not keep rare coins in stock. If you call me and ask to buy rare coins, and I have them in stock, my priority is not to get you the best possible coin for your outcome...it is to turn my inventory over. Through ASI and Doug Winter, our goal is to go out on the open market and acquire the best coins for your success, not to simply acquire a coin and move on. We want to establish a relationship with you where you can be confident in not only what you are acquiring, but where you can liquidate your rare coins in the future. We also understand that there are many sources out there to acquire coins. Our difference is not only the hands-on expertise we can offer, but in our selection process itself. We do not recommend merely old coins. For example, there are hundreds of thousands of pre-1933 U.S. rare gold coins still in existence. Less than one percent of them are truly rare. This true rarity is where our Rare Coin Program makes its focus to achieve the un-correlation to major markets, profit potential and stability all at the same time. It is nearly impossible for the non-expert investor to identify the one percent of truly rare coins in the category we propose. This is why we work with Douglas Winter, the world's leading expert in pre-1933 U.S. rare gold coins, to handpick coins for your portfolio. This allows you to take the guesswork out of the equation. In addition, ASI knows many of you already own rare coins and have not been satisfied with their performance. Others of you are holding a rare coin, or a number of coins, and have no idea of their valuation. You can send us a list of your holdings, and Doug will evaluate your portfolio free of charge. We can buy back your rare coins if you are not interested in holding a portfolio, upgrade your current portfolio or provide you with a hand-picked portfolio to increase wealth protection. Call ASI today at 877-340-0790 or send me an email. We want to help you protect your wealth with the diversification a rare coin investment provides. Our objective is always to help you Keep What's Yours!